first successful Marxist revolution just ninety miles away from U.S. shores. Driven by a sense of Third World, post-colonial comradery, Cuban guerrillas staged socialist interventions in Africa in the name of Marxism and anti-imperialism. This book’s depiction of their successes and failures, coupled with Soviet and American reactions to such brazen undertakings, makes for a refreshing literary adventure in Cold War international history. Conflicting Missions distinguishes itself from traditional Cold War histories by challenging the assumption that the U.S. and U.S.S.R. monopolized ideological intervention in the post-war era. While many readers of twentieth century history are quick to recall Soviet revolts in Budapest and Prague, as well as American operations in Vietnam and Chile, few realize how independently and ardently Cuba took to its own project of global socialist indoctrination during the Cold War. Cuba, striving to fill the aid vacuum left behind by the Soviet government’s growing disinterest funding sub-Sahara African liberation movements, led a leftist movement in Angola against the U.S.’s covert backing of rival regimes. What makes this story so remarkable was the failure of U.S. intelligence to perceive Cuba’s presence in the country. As U.S. Deputy Assistant Secretary Mulcahy recalled how ‘‘Cuba didn’t even enter into our calculations.” By successfully implementing its own revolutionary project and bypassing the world’s preeminent superpower in the process, Cuba proved itself to be a formidable communist actor on a stage where Russia’s diplomatic presence had already begun to wane. The most enjoyable interludes in the book describe Cuban philanthropy in post-colonial African villages. Stories of Cuban medical workers aiding undeveloped, rural communities bring to the forefront the humanitarian side of Cuba’s brand of communism; frequently neglected in histories of the Cold War. With Cuban doctors around, villagers ‘‘knew that their wounds need not be fatal and that their injuries could be healed.” Comments such as these color a Cold War narrative all too often painted in broad, black and white strokes. 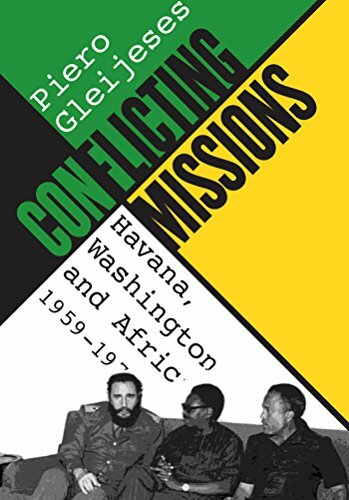 That Conflicting Missions achieves this feat in an exceptionally readable, wanderlust-inducing form makes it a welcome addition to the widening circle of global Cold War scholarship.